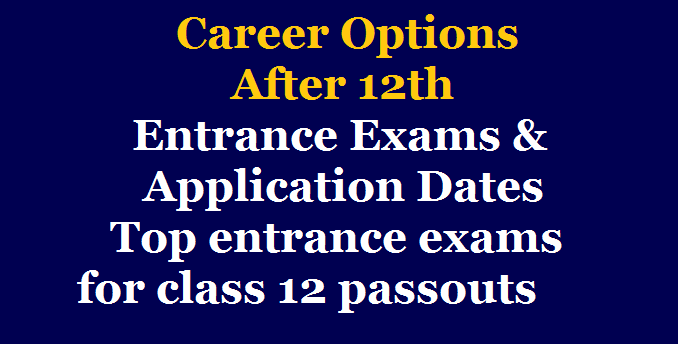 Career Options after 12th -Entrance Exams and Application Dates | Top entrance exams after class 12 passouts | Top Entrance Exams after Class 12 | Career options after 12th | Competitive Exams after 12th | Entrance Examinations after 12th standard | List of Competitive Exams For Further Studies After 12th | List of Competitive Exams For Further Studies After 12th | Competitive Exams For Further Studies After 12th | Entrance Exams after 12th | List of Entrance and Competitive Exams For Further Studies After class 12, Top Entrance Exams after Class 12. After class 12th board exams many of you must be quizzed to select stream and graduation course for themselves. With just common career options after 12th, are you just left with choices for graduation in streams like science, humanities or commerce.? Just hold on, as we have compiled a list of top entrance exams after 12th for conventional and unconventional UG courses and jobs. Some of the below mentioned entrance exams after class XII and courses are All India level (National Level) while others State Level or colleges’ own specific entrance exams. Here is a list of some of the top entrance exams after class 12 passouts can appear.